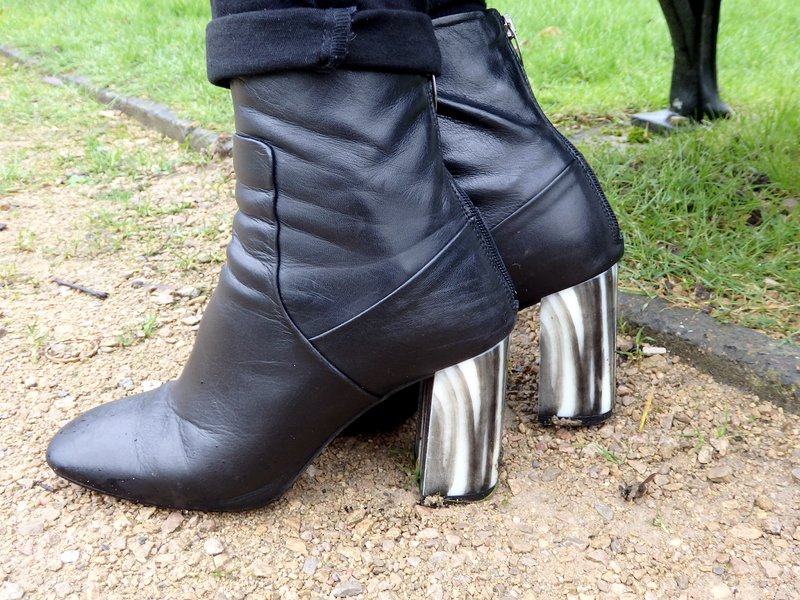 The Topshop Muse boots instantly drew me in when I saw them online afew weeks ago. I love heel details. I had previosuly been lusting over some from Reiss with a wooden heel but then I saw these. They are so so comfortable, the leather is very soft. The heel is a comortable 3.5 inches with no platform. When I first got these I found doing up the zip difficult as it is up the back of your heel but after a few wears they stretch a tad and it's a piece of cake. I think these boots are perfect for a casual outfit like what I am wearing here but equally as perfect with a dress and jacket. Overall these were a great purchase. What do you think to the heel detail? Wow!A velvet touch on my favorite color!I always prefer knee boots because it's more protective to our feet. This is called the best work boots to me. Top-shop muse bone Boots is a new trend or style. His matching sense is superb. Black coat with black shoes is looking very good and attractive. A lot of links of similar blog here i found due to its unique fashion related articles.